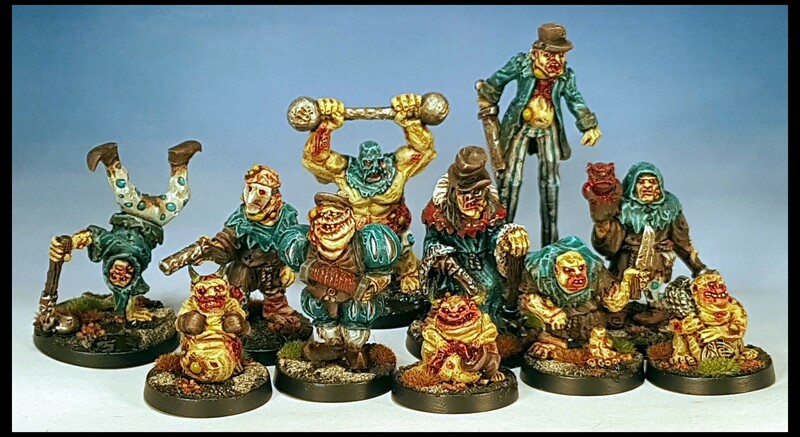 I added to the six finished Circus models, bringing the total up to seventeen, finishing them on time to bring them to Bring Out Your Lead 2018, coming up this weekend. I hammered through these models quickly, going for a primarily wash and drybrush approach. 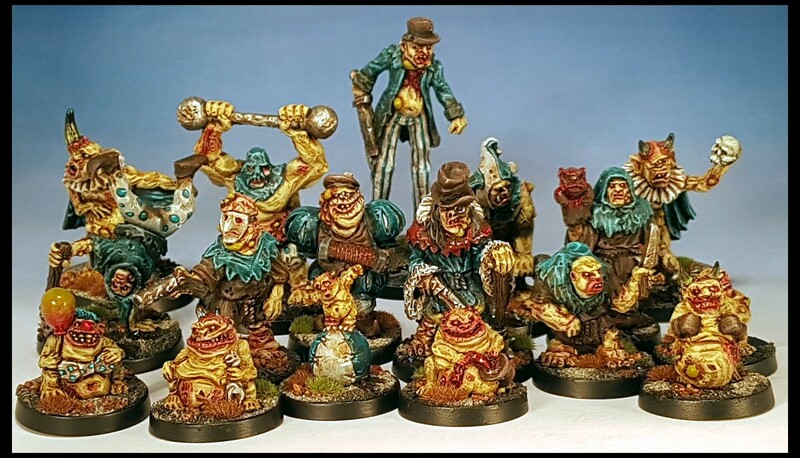 I have another seven models to paint before I have completed my Circus, but hopefully they will be finished in the Autumn, in time for a few games of Age of Sigmar, in which I plan to use the lot as a unit of Marauders, and possibly use the cart as an altar of some sort. All seventeen finished to date. Lovely mate – looking forward to seeing them in the (rotten) flesh! I am looking forward to dumping The Dysenteria Three Ring Circus on the table for a game though. They should be a bit of fun. 😀 Looking forward to it mate – see you there! Are you going to make it to BOYL again this year? Nice creepy bunch! Well executed! The revolting sculpts did a lot of the work really, plus even healthy clowns creep people out, so it’s not too difficult to get the right look I think. They have a rotten, putrid, washed out look to them. Some sort of feverish, jaundiced look was the goal. I dunno how “realistic” it is or isnt, but it presses the right buttons I think. Thanks Warburton. The paint jobs were pleasingly fast to execute. I hope to add a few more soon. Very creepy. They all look varied, but cohesive. Great use of color. I wanted something a little different to the usual Nurgle palette, but still feverish, filthy and foul. It worked pretty well I think. Hopefully I can spin it out into other warbands and gradually build an army.